Uv EB West Less One Month Away — Energy Sciences, Inc.
It’s not too late to get signed up and/or to make plans to attend UV.EB West 2015 Electron Beam conference in Redondo Beach, California. Get connected with industry leaders and authorities in your field. 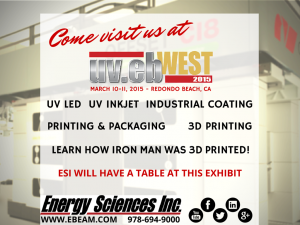 UV.EB West 2015 will be covering eBeam Technology, electron beam curing, 3D Printing, Industrial Coatings and much more. Although the event space is sold out, you can still attend, get involved and your company can still be a sponsor. For further information, please email mickey@radtech.org for information on sponsorships. In terms of attending the event, keep in mind that printers and converters can attend free of charge. Some of the biggest names in the industry will be at UV.EB West 2015, and this type of convention is perfect for networking. Maybe you want to grow and expand you market, you just haven’t found the right partners or connections? Are you looking to learn about new technology and processes? EV.EB West is even a great place to find new recruits and to inform people that you are looking to add to your growing team. Don’t miss out on UV.EB West 2015; ensure you company remains on the cutting edge by attending the convention.